The tune auto-played in my mind during my six years living in the Middle East. Me, a foreign national with no skin in the Arab vs. Israeli conflict, inadvertently stepping on toes with every mundane action. I once wrote a story about Israeli recycling, heralding it as a benchmark for the region to strive for, and received death threats in comments from Jordanian and Egyptian readers. A side trip to Bethlehem while visiting Jerusalem had Jewish friends warn me of terrorists posing as tour guides and drivers, the day trip angered others who viewed my visit as supporting “the opposition”. I’d bring back bricks of Toblerone chocolate from airport duty free, and have Arab coworkers refuse a bite, calling it Zionist candy. That’s the tip of the “we’re certainly not friends” iceberg. I learned a lot from these experiences on how to navigate coexistent yet opposing realities. But the real takeaway was a refined appreciation of any instance where people unite, respectful of their differences, but moving towards a better future. Buckle in for a good example below. 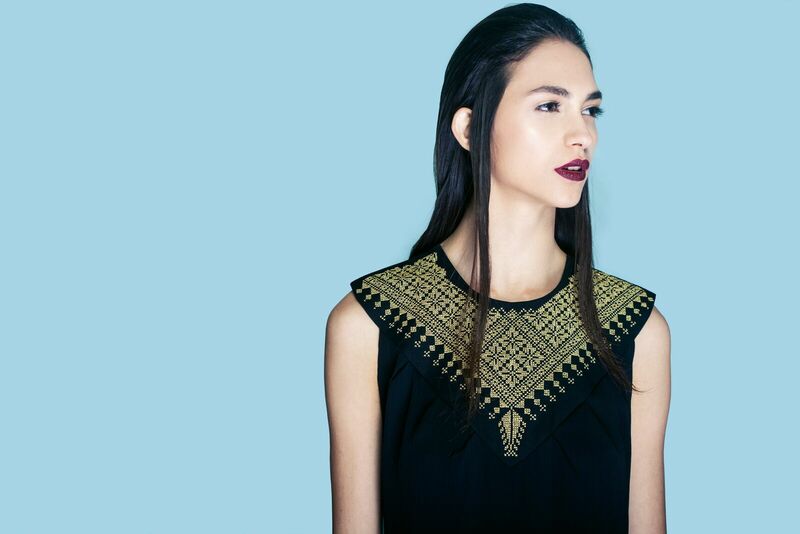 Jerusalem-based Two Neighbors is the brainchild of an Israeli designer and a Palestinian embroidery artist founded on tolerance and friendship. It’s a social entrepreneurship fashion label built by Israeli and Palestinian female entrepreneurs and supported by American philanthropists eager to make an impact as investors. Launched in 2009, the accessible luxury brand is known for contemporary takes on the traditional Palestinian thawb (robe) as well as a collection of leather handbags in trendy shapes which incorporate vivid dashes of regional embroidery. Skilled designers and artisans from both Israeli and Palestinian backgrounds handle all production. 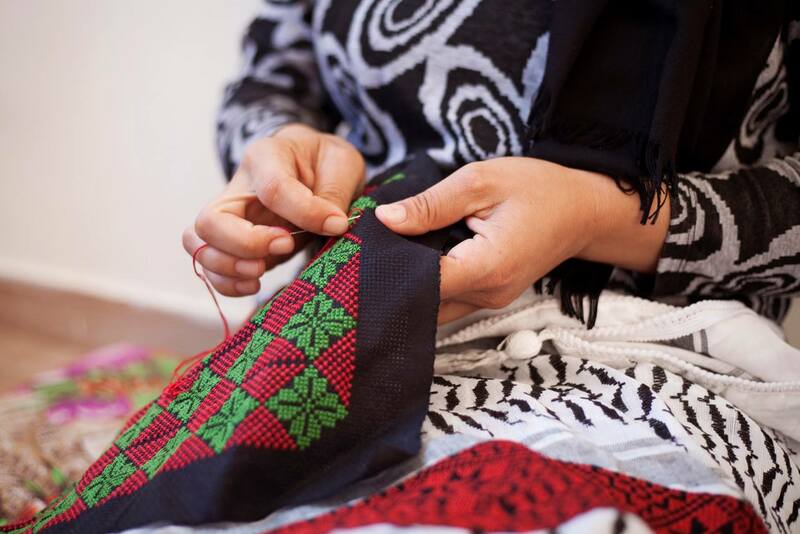 A women’s cooperative in a West Bank Palestinian village embroiders panels of fabric, which are then stitched into garments and accessories by Israeli designers based in Tel Aviv. The group is preparing to drop a new collection of embroidered canvas handbags and clutches later this year. In the US, the line is stocked at the Jewish Museum of New York and is also available online and through various pop up shows. “Well, charity probably isn’t going to solve a conflict that’s lasted thousands of years,” said investor Whit Jones, who founded the business with life-long friend Andy McCluskey. They provided initial funding, marketing and distribution for this social business. Through the work, they’ve developed relationships with Israelis and Palestinians who wish to set conflicts aside and work together, both for their own benefit and to further the cause of peace.But he’s seen real results with the Two Neighbors’ social entrepreneurship model. In 2006, they first visited a Palestinian women’s sewing cooperative in a West Bank village known for non-violent resistance and participation in dialogue. Jones remembers, “They took us into their store. It was a single room with no lights, just pitch black. They brought things out one by one to show us in the daylight and the work was very nice.” The co-op members had two priorities: to sell something and to gain recognition for their craftsmanship. They became the first artisans to work with Two Neighbors. According to their website, the Jones’ then brought the Palestinian artisans to meet with several Jewish Israeli designers in a motel that teeters between the border. At first it was awkward. The participants were standoffish. Jones called their 2009 product launch of hand-embroidered coffee cup sleeves “the worst idea ever.” Nothing sold at all. Then they ran a Kickstarter campaign, using the funds to create a contemporary collection of thawbs— the flowing, flattering robe that has lost popularity with younger Palestinian women, who often prefer jeans for informal occasions. Then there was the breakthrough day. One woman brought her infant to the motel appointment. “They all ooed and aahed over the baby,” said Jones. “Then someone else brought her child the next time. The friendships started around the kids.” Today, Mrs. Jones estimates 20 participants who share a strong bond and know what is going on in one another’s lives. The additional 30 participants coexist, cooperate, and exchange polite chit-chat, but treat their work as a business relationship. Although any emerging label faces challenges, Two Neighbors’ faces its own particular hurdles. First, there is a high amount of turnover. For two years, a group of skilled Russian Jewish immigrants did much of the production in the basement of a synagogue, receiving plastic bags of work through an open window, then passing it back once they were done. They abruptly ceased all contact without any explanation. When political tensions run especially high, there can be long delays in communication, resulting in an inability to pass work across checkpoints, or even work at all. There was a steep learning curve. “Women who could sew dresses beautifully didn’t know how to measure four centimeters with a ruler,” admits Jones. “They just hadn’t been taught that.” The same women now take home regular paychecks for the first time in their lives, with some beginning to invest funds in education or becoming small business owners. They no longer depend on male relatives for financial support, and as a result can make more of their own decisions. Although it wasn’t intended as a female empowerment initiative, Two Neighbors has become just that. Then there was the matter of finding a shared language. “The best way for us to communicate is by meeting each other face to face to talk and make decisions together,” explained Israeli designer Miriam Gavin. However, at times the distance or road closures make that impossible. Since the Palestinian embroidery designer only speaks Arabic, and the seamstresses only know English and Hebrew, they text photographs of product designs and experiments back and forth. “We found a creative way to communicate with phone emojis,” she tells me, demonstrating how they offer positive feedback to one another by sending a smiley face emoji. Enterprises such as Two Neighbors must continue. They allow us to naturally open up to one another, to focus on commonalities and mutual aspirations. Let us know of other similar initiatives you’ve encountered, and let us know if positive news appeals. Learn more at The Two Neighbors website (link here).